Cyclone Titli that hit Andhra Pradesh coast in the wee hours of Thursday, devastated Baruva village in Sompeta mandal. 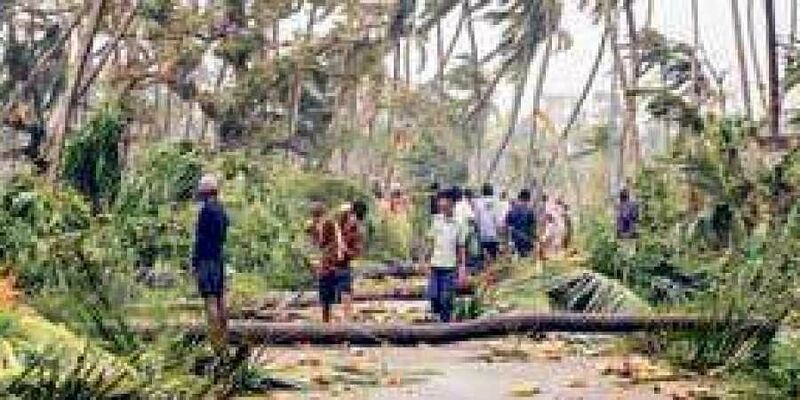 BARUVA (SRIKAKULAM) : Cyclone Titli that hit Andhra Pradesh coast in the wee hours of Thursday, devastated Baruva village in Sompeta mandal. A visit to the thickly populated coastal village, nearly 40 km from Berhampur, makes one wonder as to how a place with peace and tranquility can be a victim of nature’s fury. While thatched, tile and asbestos-roofed houses were damaged, trees were uprooted and debris strewn all along the road leading to the village. Power connection was also snapped as transformers and electric poles were damaged disrupting water supply and plunging the entire village into darkness. Fisher folk and people residing in low-lying areas close to the sea were the worst hit as apart from the high speed wind that blew away roofs over their houses, sea surge inundated vast track of fields with standing crops. Though no loss of life was reported as people from vulnerable areas managed to leave their houses prior to the landfall, they alleged no evacuation was carried out by the officials. “From TV reports we knew that the cyclone would hit Andhra Pradesh coast, but we did not expect it would cross this way. Hence, we were in our houses on Wednesday night. As the sound of wind became furious and its speed increased, we rushed out and went to safer places,” said a villager to visiting TNIE photojournalist Biswanath Swain.Many villagers were spotted collecting food stocks, clothes and utensils from their damaged houses while some others were trying to remove tree branches fell on their houses amidst heavy rainfall.